HomeSan Pedranos Place Top 3 in Conservation Awareness for Reef Week Belize. San Pedranos Place Top 3 in Conservation Awareness for Reef Week Belize. 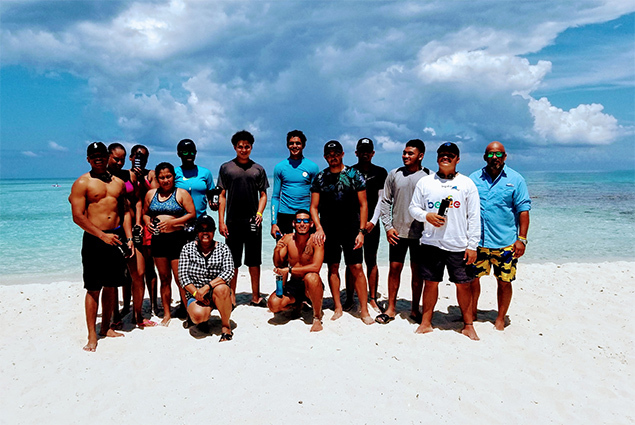 Swimmers for Clean Oceans and to Connect-2-Earth - Twelve swimmers set out on Sunday, March 17, 2019, from English Caye to swim 1.6 miles to Goff’s Caye. The wind and seas were in the swimmers’ favor with winds hardly reaching 5 knots and mostly flat seas. This is the 7th annual English Caye Channel Swim Challenge to bring attention to conservation issues in conjunction with Reef Week 2019 while showcasing the swimming talent in Belize. 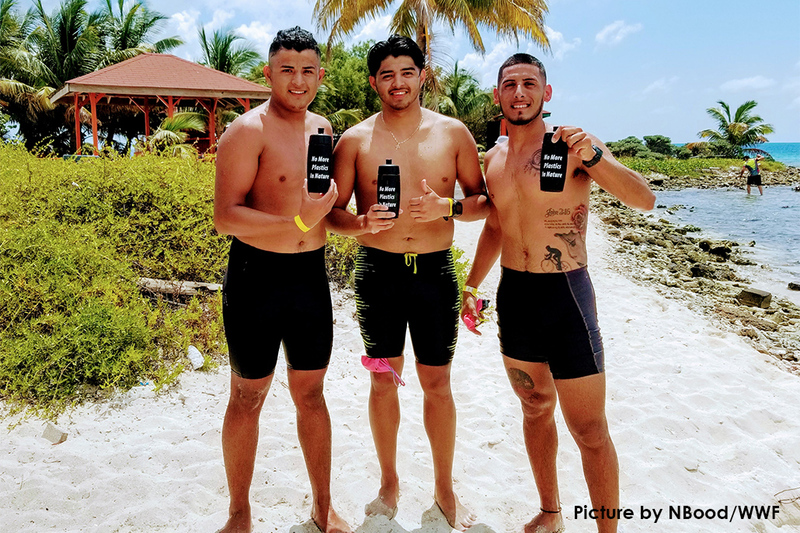 The first swimmer to reach Goff’s Caye, Brandon Santos, completed the swim in 47 minutes and 28 seconds with swimmers, Jordan Santos and Kian Ancona (Trejo), following close behind within a minute of the lead swimmer, showing that there is serious swimming talent in San Pedro Town. Although there was a half hour separation from the 4th swimmer, Giovanni Alamilla Jr. showed there is young talent up and coming. However, swimmers after Alamilla had to contend with a rising tide that pulled them eastward towards the blue waters. Alamilla and the remaining swimmers had to make extra effort to reach the clear sands of Goff’s Caye. Special mention must be made of the four women of the Belize Coast Guard (BCG) that participated in the swim along with one seaman demonstrating BCG’s fitness in the marine environment. The Belize Coast Guard, Belize National Triathlon Association, Coastal Zone Management Authority and Institute (CZMA&I), Belize Sea Scouts and Reef Beauty Charters were all on hand to provide safety support to swimmers. The Belize Port Authority provided clearance for the swim to proceed across the channel. 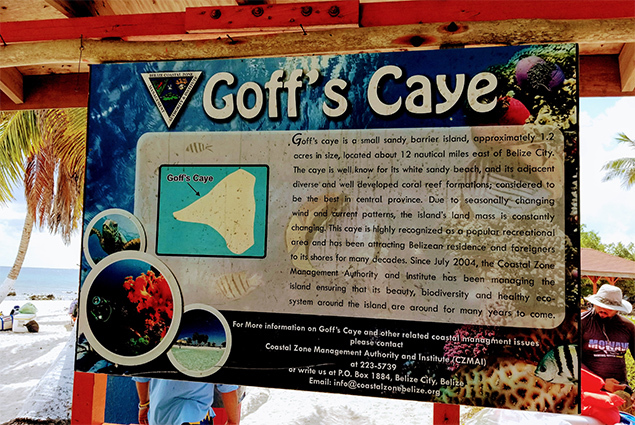 Goff’s Caye has postcard perfect beaches and CZMA&I organizes frequent excursions for locals to enjoys the caye. This event was made possible through the generous support of Stationery House Retail Outlet and contributions from Radisson Fort George Hotel and Marina, Bowen & Bowen and Idealabs. Like previous years, this year also had the collaboration of the World Wildlife Fund that added its voice to the concern about pollution of our oceans including the Caribbean Sea and the Belize Barrier Reef Reserve System. 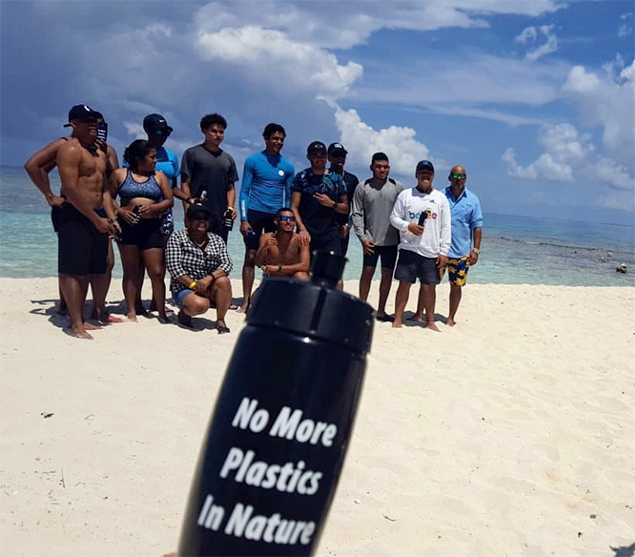 Participants were sensitized and Belizeans should be anticipating the passing of the proposed legislation to phase-out single-use plastic and styrofoam and utensils.